During cardiac imaging, it's not unusual to make unexpected findings outside the heart. Indeed, during cardiac MRI scanning incidental extracardiac findings are reported in around one-fifth of cases, and during coronary CT scanning the reported prevalence of incidental findings is even higher. 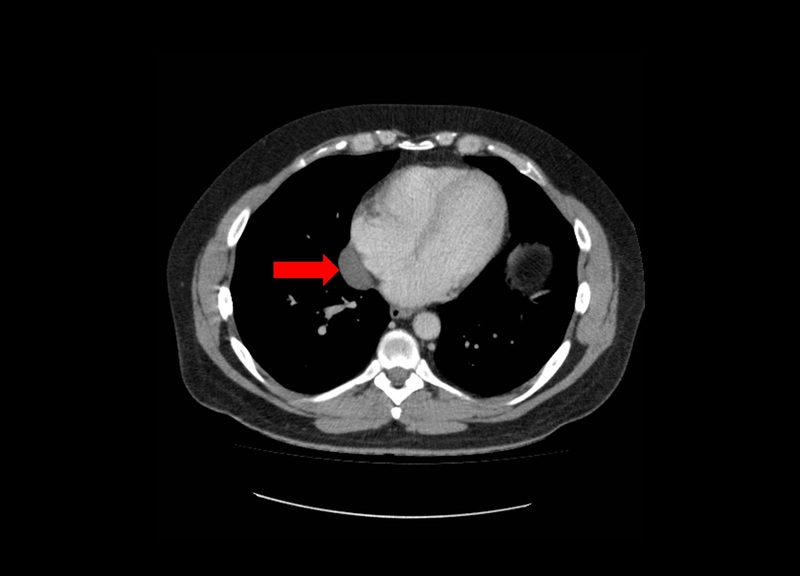 The image below shows a CT scan, and there's an incidental finding of a 'mass' adjacent to the right atrium. So what is the nature of this mass? This is a pericardial cyst - an uncommon abnormality. On CT scanning pericardial cysts are well-defined, thin-walled and do not enhance with contrast. 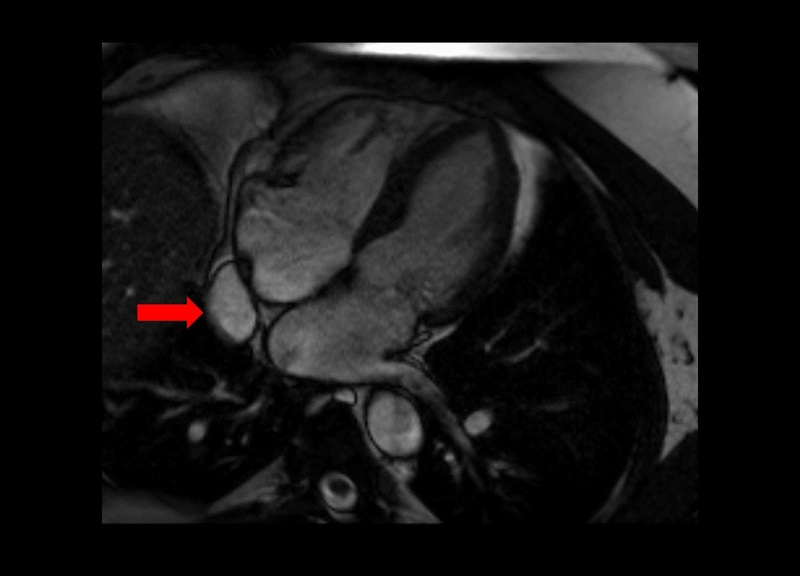 On cardiac MRI (see example below) fluid-filled pericardial cysts appear hypointense on T1-weighted images, and hyperintense on T2-weighted images, and do not enhance with gadolinium contrast. Most cases are congenital cysts, but they can also be acquired following cardiac surgery, trauma or pericarditis. Pericardial cysts are found in 1 per 100,000 individuals and can occur anywhere within the pericardium, although they are more commonly found adjacent to the right heart than the left. Pericardial cysts are usually asymptomatic, but in some cases present with chest pain, palpitations, breathlessness or cough. They are usually benign, but (rarely) life threatening complications such as cardiac tamponade have been reported. Pericardial cysts are usually managed conservatively, but percutaneous aspiration (sometimes with ethanol sclerosis) or surgical resection can be considered if the patient is symptomatic or in the event of life-threatening complications. Kar SK, et al. Pericardial Cyst: A Review of Historical Perspective and Current Concept of Diagnosis and Management. Interventional Cardiology Journal 2015; 1: 1-8. Information about the management of pericardial cysts can be found in the ESC 2015 Guidelines for the Diagnosis and Management of Pericardial Diseases.